Multi-purpose MarTech solution that serves to optimize the reputation management workflow for business owners and marketing professionals. Client: a U.S.-based marketing technology company that provides integrated brand management solutions for online businesses, from local entities to large franchises. A well-tended online business presence is the product of careful work with dozens of tools. The necessity to hop between listings, review sites, and social media accounts adds to a marketer’s workload and heightens the risk of a mistake or a missed opportunity. The task is even more daunting for companies with multiple locations. Knowing this, the client envisioned an integrated solution that would allow business owners and marketing professionals to broadcast a consistent message across all platforms, promptly handle negativity, and keep an eye on performance. The client also planned to monetize the solution by splitting it into service packages that can be activated or deactivated to suit a tenant’s marketing goals. Oxagile helped the client design a multi-purpose marketing solution that ties all brand management activities to a single dashboard and largely automates the workflow. The system’s capabilities make it invaluable for franchises and large companies with multiple locations. The system supports several user types. The client’s administrators govern user roles, give out access to various system modules, and create new business accounts. Tenants are represented by business owners that acquire the client’s reputation management packages depending on their company’s strategy. Small businesses that don’t keep marketing professionals on staff can hire account managers to help them with brand reputation activities within the platform. Keeping your local directory profiles full and up-to-date is a must if you want to make sure your product or service can be easily found online. Oxagile’s team implemented a seamless Yext integration to help business users set up and edit multiple local citations. Every change submitted to the user’s business profile triggers updates across their preferred listings, while the status of every listing — live, processing, or unavailable — can be tracked directly from the dashboard. As a result, businesses can keep their online details accurate and earn a higher ranking in local search with minimal effort. The solution provides users with downloadable analytics reports regarding a listing’s profile views, Google Customer Actions, device usage over a chosen period, device usage by weekday, Google search queries, Google Views on Search and Maps, Google Phone Calls by hour, and a host of other metrics. With business directories taken care of, the next logical step is finding out how popular your services are online. Oxagile employed its SEO expertise to equip the platform with a full-blown rank tracking module that allows users to monitor global and local SERP rankings for their business, compare keyword rankings with competitors’ data, and generate detailed SEO reports. The review management module lets users take control over what is said about their business online and nurture customer relationships. 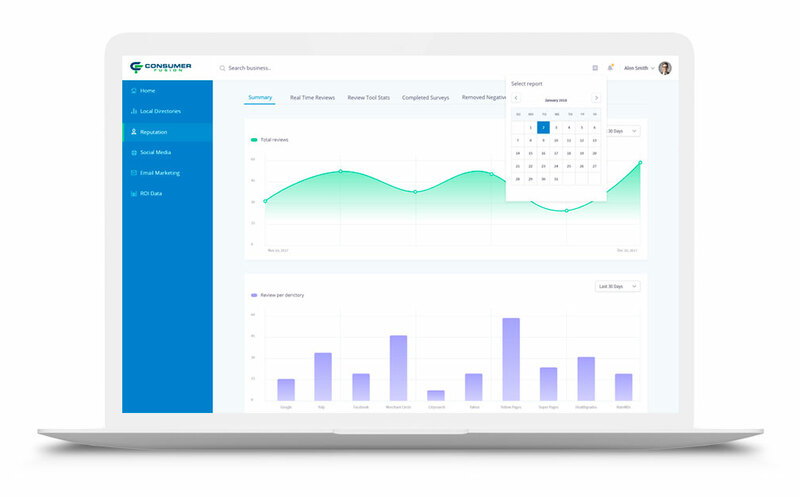 In a few clicks, the user can access overall review statistics for their business, schedule weekly or monthly reports, browse the latest submitted reviews and star ratings across the web, and reply to Google and Facebook reviews directly from the dashboard. Unfair or fake negative reviews can severely damage a business and turn away potential customers. To address that issue, the platform helps clients contact business directories to have such reviews inspected and removed. A good way to gain more positive reviews is to message or email customers and ask them to share their feedback online the very day they use a service or product. The platform’s review tool helps users automate these surveys and process the results to improve customer service. With the solution comprising several modules and depending on a number of external services, QA efforts were focused on ensuring smooth and reliable communication between all units. In particular, our QA Team tested the solution’s integration with the Yext platform, the Authorize.Net payment system, and the survey generator SurveyMonkey. End-to-end testing involved full sequences of the following actions: creating a new business account, buying a subscription, configuring a recurrence query to collect third-party data, scheduling report generation, and more. The client appreciated the team’s ability to deliver within harsh deadlines, especially when the development of a new feature involved unfamiliar documentation. Transparent communication between all team units and the stakeholders meant that any discrepancies in the requirements or designs were resolved in an efficient manner. The platform has been successfully launched and currently serves about 1,600 registered businesses. At this point in time, the team is working on enhancing the functionality and expanding the available services package. I highly recommend Oxagile for any size project. Oxagile’s professional team has worked with us closely to design, develop and execute an award-winning platform that continues to get better with each and every phase. We have put the Oxagile team under great pressure to deliver some of the features with little to no notice and they have come through on time and delivered a great software product. I highly recommend Oxagile for any size project as we started small on our project and grew it into a major platform that is used by thousands of users on a daily basis.